Hawkeye Gough is one of the Four Knights of Gwyn and the leader of the Greatarchers, who wielded giant bows that fired large, dragon-hunting arrows. Ironically, despite his name, he thinks he is blind, yet he still retains his impeccable accuracy. He wields his own unique greatbow and makes his own arrows to use with his bow. Nowadays, he spends his retirement making archtree carvings in Oolacile in the additional content. Gough provides a huge amount of information for an NPC character. 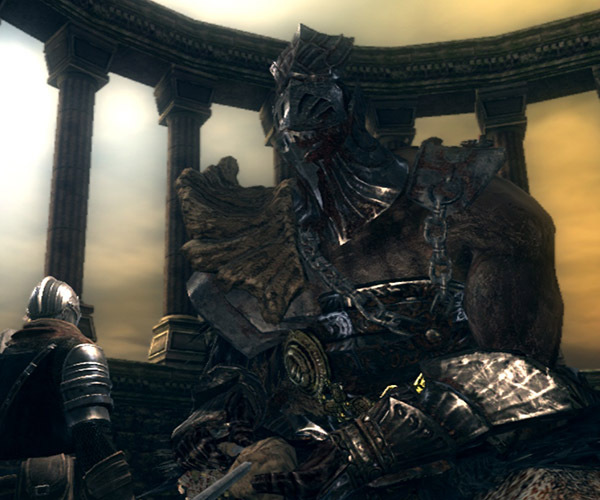 When spoken to, he makes numerous remarks about the state of affairs in Oolacile, and warns the player about Kalameet (but will assist by crippling him with an arrow if asked). 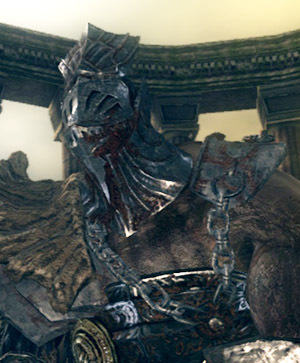 He is grateful to the player for killing the corrupt Artorias, but in cut dialogue is saddened at the consideration of Ciaran ("the poor, poor girl"), suggesting Ciaran had unrequited romantic feelings for Artorias. After killing Kalameet, Gough will thank the player and give him his greatbow. After Knight Artorias's arena, facing the Oolacile Township, turn left and go up the stairs opposite to Battle of Stoicism Gazebo. Eventually you'll reach the hole in the ground, turn right here and cross the bridge leading to the door. To open it you'll need Crest Key found during Oolacile Township exploration. Gough will be waiting for you behind the door. If you've been down to see Kalameet, you can talk to him to get him cripple the dragon, allowing you to fight Kalameet on the ground. Gifts Gough's Greatbow. Use "Talk" option after killing Black Dragon Kalameet. Dung Pie 200 Turns enemy toxic, but also affects player. Homeward Bone 300 Return to last bonfire rested at. Lowest price of all merchants. Prism Stone 10 Path marker. Drop and listen to check heights. Titanite Shard 800 +5 reinforce: standard weapon. Large Titanite Shard 3,800 +10 reinforce: standard weapon. +5 reinforce: raw weapon. Green Titanite Shard 4,800 +5 reinforce: magic/divine/fire weapon. Gough's Great Arrow 650 Can only be used with Dragonslayer Greatbow or Gough's Greatbow. Gough is the only merchant who sells this. Hello Carving x1 5 Archtree carving. Says "Hello". Thank you Carving x1 5 Archtree carving. Says "Thank you". Exhausting Gough's conversation line reveals that he and the Giant Blacksmith are well acquainted, with the Blacksmith likely being the forger of Gough's Greatbow and armour. This would explain why the Hawk Ring is found in a chest behind the Blacksmith. This fight is reminiscent of the Old Hero boss battle from Demon Souls, a battle with a blind boss who relied on sound. He heals quickly from Poison or Toxin. If you manage to inflict these on him, they will only run for 25% of their usual time. If you have attacked Hawkeye Gough and he's trying to smash you into a pancake, you can equip the Slumbering Dragoncrest Ring to safely walk around his little area. Attacking him with the ring equipped will make him aggro for a few seconds, but if you evade his attacks and cease your assault, he will look around and wander back to his start position. This is a useful, relatively safe, and cheap way to get his armor set. As Gough states in his dialogue he is blind, and fights based on sound alone. Any character can easily (if not quickly) beat him by running in and hitting him once, then leaving and stopping. He will de-agro immediately after finishing his attacks and begin listening for you. You can then walk (not run) back up to him, hit him, then run back and hold still while he de-agros again. The fight is made a little easier with the Slumbering Dragoncrest Ring because you no longer need to walk. Ring Of Fog and Hidden Body have no effect, because he is blind. Do not go between his legs or he will body slam and it's hard to escape from. He is weak to Magic. Slumbering Dragoncrest Ring makes you almost undetectable, and free to attack at range with Magic. Hm? A visitor, have we? Thou must be the one who freed Artorias. He left this world with honour intact. …And here I am, retired and blind. Of little help to thee, I am afraid. And I see that the great black dragon Kalameet is dusted by thine hand. Wondrously played. Lord Gwyn's blessing upon thee. I am retired, and blind. To receive a visit by one as lofty as thyself, is a great honour indeed. Well, thou hast come again. This is a surprise. Well, thou com'st again. Thou art a strange one. Ah, hello there. What of Kalameet? He is an ancient dragon. Skyward or no, he will not be put down easily. Thou com'st again, legend of humans. It is always an honour to speak with thee. If thou seeketh to explore this domain, be wary of a black dragon. I fear thee no match for this terrible beast. There is very little to be said. What good is a dog, with no hares to hunt? …I am lucky to be alive, I suppose. But the Dark of the Abyss, which swallowed poor Artorias, threatens to devour our entire land of Oolacile. …But even so, one day the flames will fade, and only Dark will remain. And even a legend such as thineself can do nothing to stop that. The Black Dragon troubles you yet, I see. …Hmm, yes, I see… I was mistaken. …Art thou prepared to challenge great Kalameet? Yes, surely that is best. We knights fought valiantly, but for every one of them, we lost three score of our own. Exhiliration, pride, hatred, rage… The dragons teased out our dearest emotions. …Thou will understand, one day. At thy twilight, old thoughts return, in great waves of nostalgia. I shan't need it, with no dragons to hunt. Now, do not mistake my words. I cherish my work. Wood carving is a nuanced art. I would have much to talk about with that blacksmith. In truth, how is the old chap, I wonder? Still hammering away, I should hope. Good morrow…Is the Black Dragon posing thee duress? A ferocious dragon indeed, even mighty Anor Londo dared not provoke his ire. …Thy intent is to persevere… to the bitter end, hmm? I have taken a liking to thee. And I owe thee much for thy service to Artorias. Now watch, and see how Gough hunts dragons. That bat will be grounded for a good spell! The rest is in thine hands. I await good tidings. A wise choice. Why foist thyself unto the fiery maw? Why, thou hast defeated Kalameet! That beast will never take to the skies again. I see thou hast dusted the great black dragon Kalameet. I see that there is at least one legend among ye humans. Dear me… That old bat will never fly again. May every honour be bestowed upon thee. Understand this. I wish thee no harm. Ahh, so this is true human nature. May you perish, for the good of all!